Online registration is now closed. But don’t worry, you can register at the conference on the day of. 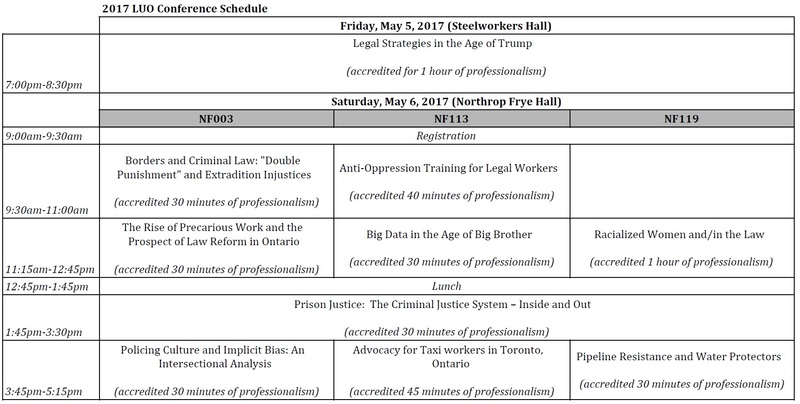 SATURDAY, MAY 6, 2017 – NORTHROP FRYE HALL – UOFT – 73 QUEEN’S PARK CR E.
This panel will provide an opportunity to discuss the challenges and opportunities for lawyers to assist progressive movements that are organizing against the new US President, and organizing against similar ideologies in Canada, including on issues of racism, immigration, human rights, labour, militarism, austerity, and civil liberties. 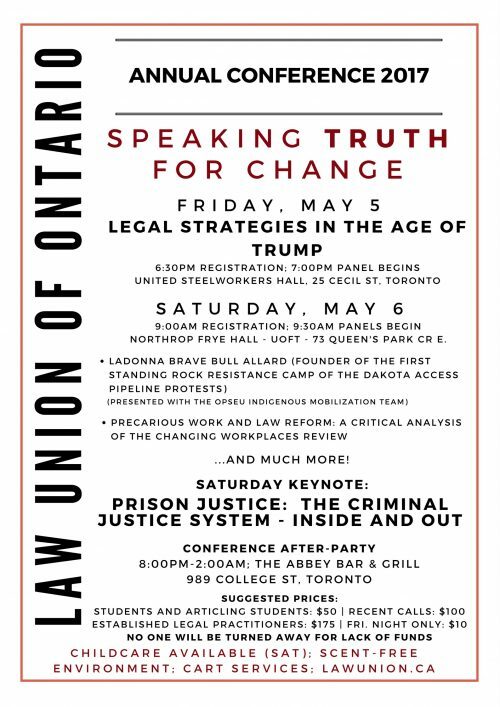 The panel will touch on the limits of lawyering in supporting affected communities; and specific legal issues that the progressive legal community in Ontario can support and mobilize around. Panellists will discuss the opportunities for cross-border cooperation between progressive legal communities in the United States and Canada, and beyond. 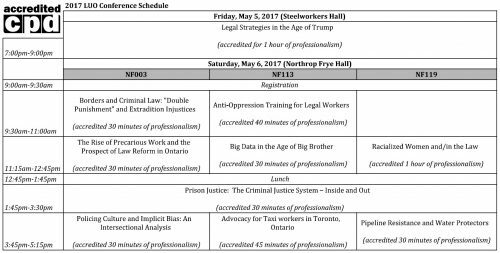 This panel will explore intersections of Canadian criminal, immigration and extradition law. 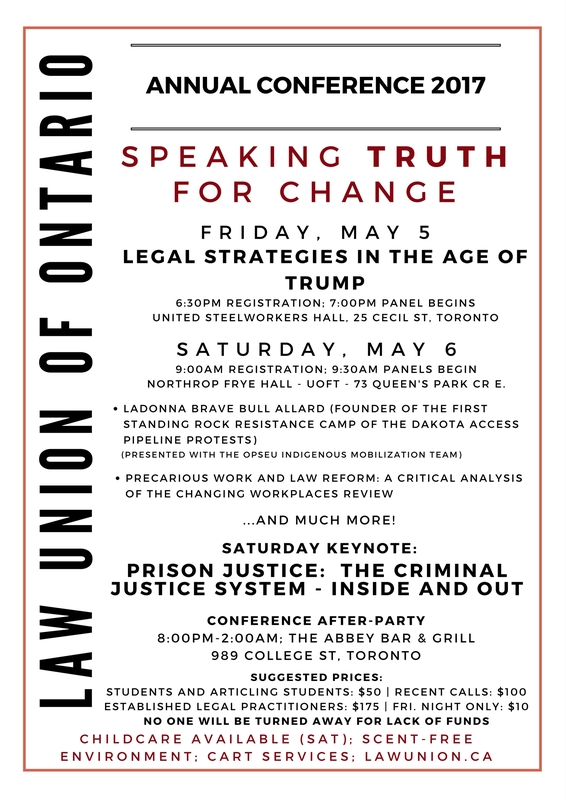 It will include must-know essentials for both criminal and immigration practitioners as well as a critical exploration of injustices built into these laws, using the case studies of Deepan Budlakoti (a man Canada rendered stateless who was punished criminally and is now facing deportation) and Hassan Diab (a Canadian citizen extradited to France based on flawed evidence). Related: Anthony Navaneelan, Immigration consequences of criminal pleas and sentencing: Duties of the defence counsel. Back by popular demand! 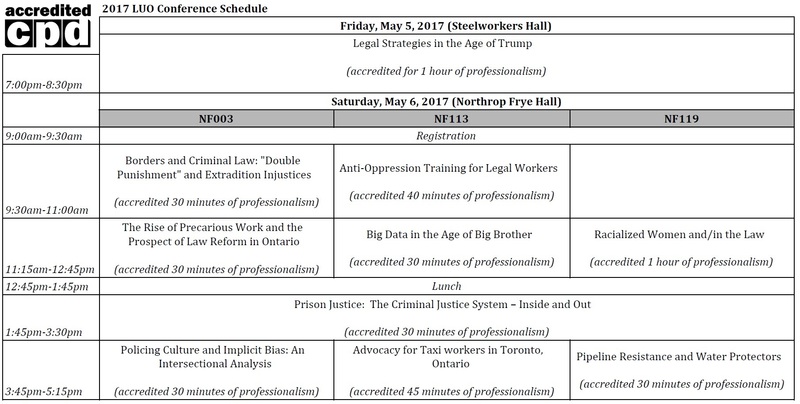 This session will provide legal workers with an opportunity to learn about anti-oppression theory and practice. Participants will be encouraged to draw on their own wealth of knowledge and experience to gain deeper understandings how systems of power and oppression shape their day-to-day work in law offices, social movements, and in the legal system at large. Through group-based exercises, participants will discuss how to be mindful and critical of social hierarchies, with a view to exploring how relationships of harm can be reproduced through the legal profession and how these power dynamics can be challenged. This panel will critically assess the results of the Changing Workplace Review and the prospect of workplace law reform in the near term. In 2014, the Wynne Government launched the Changing Workplaces Review to address this growing trend. Panelists will evaluate the legal reforms being proposed in the Review, the extent of possible law reform, and what strategies will be necessary to improve working conditions and stability for Ontario’s workers. Moreover, the panel will discuss how law students, paralegals, and lawyers can engage communities that they work in through organizing, lobbying of politicians, and engaging workers impacted by precarious work. This panel will discuss the issues surrounding the collection of Big Data, and the implications for its misuse, by educating to prevent abuses by the State, Corporations and individuals. In particular, issues of concern for the legal profession are intelligence-led policing, invasive marketing practices, social media, international human rights and migration. Civil Liberties topics such as privacy, national security, surveillance, free speech and information ethics will be addressed. A legal discussion paper generated by Jack Gemmell will be distributed, and a technical handout will be distributed by Fred Ernst. This panel aims to bring together racialized and Indigenous women from the legal profession to share their experiences as legal practitioners with intersectional identities, and some of the practical strategies they have used in confronting pervasive attitudes towards women and racial minorities in the legal profession. The panelists will reflect on their own impressions of inequities in the law, the ways in which these inequities affect sexual and racialized minorities, and the kinds of changes necessary to ensure access to justice for sexual/gender and racial minorities. Join our Moderator Lee Chapelle, President of Canadian Prison Consulting Inc., for a riveting and critical discussion on the current state of the Canadian Justice & Correctional systems. 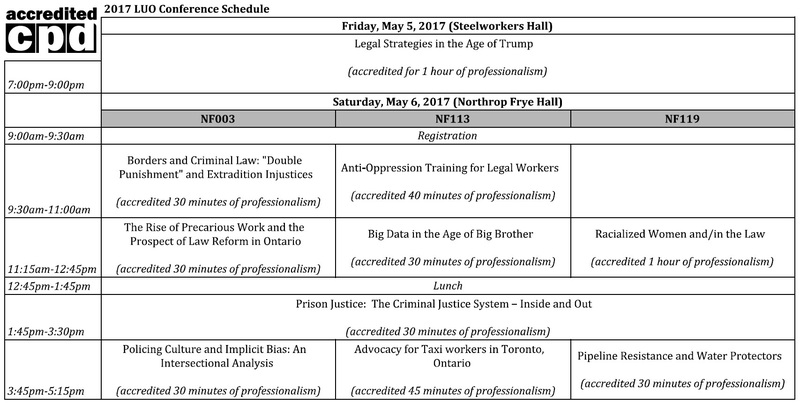 Featuring experts in diverse roles this panel will present a critical review of how the Canadian Justice and Correctional systems interact. Discussion will include a review of key issues such as mental health care in prisons, programming availability, bail and the over-reliance on pre-trial incarceration. Further discussion will entail an overview look at the process from arrest to release with an emphasis placed on the realities of Provincial and Federal parole. Related paper: The Honourable Mr. Justice Arthur Gans, Judicial Recommendations in the Sentencing Process: Myth or Reality? Moderator: Lee Chapelle – President of Canadian Prison Consulting Inc.
With respect to Police Culture, the panel will discuss the impact of an organizational culture that prescribes unwritten roles and social codes that dictate the way that a person, in this case police officers, will function including a sense of solidarity among the group and a will to conform. Implicit Bias is almost universally defined in the following way: Implicit bias refers to the attitudes or stereotypes that affect our understanding, actions, and decisions in an unconscious manner. These biases, which encompass both favourable and unfavourable assessments, are activated involuntarily and without an individual’s awareness or intentional control. Residing deep in the subconscious, these biases are different from known biases that individuals may choose to conceal for the purposes of social and/or political correctness. Rather, implicit biases are not accessible through introspection. Over the past 15 years a large body of psychological literature with respect to Implicit / Unconscious biases has emerged. Empirical evidence exists which supports the assertion that most of us to a greater or lesser extent including persons who avow egalitarian views and subjectively do not exhibit racism actually hold what are described as implicit biases against Black persons, other racialized persons, women, LGBTQ persons and other community members. This panel will present the legal issues facing Toronto Taxi Workers within “the sharing economy.” Issues such as uneven application of the Toronto Municipal Code within the Ground Transportation Industry since the incursion of the Corporation Uber into the Toronto landscape will be examined. Policing issues, worker health and safety, income security, and discrimination in a predominately racialized occupation will be addressed, within the context of much needed Regulatory reform. This panel will discuss the legal issues for movements resisting the development of oil pipelines through sensitive aquifers and Indigenous Peoples’ traditional territories. Legal defence strategies, environmental law and advocacy and the need for enforcement of environmental, Indigenous and social rights will be addressed. 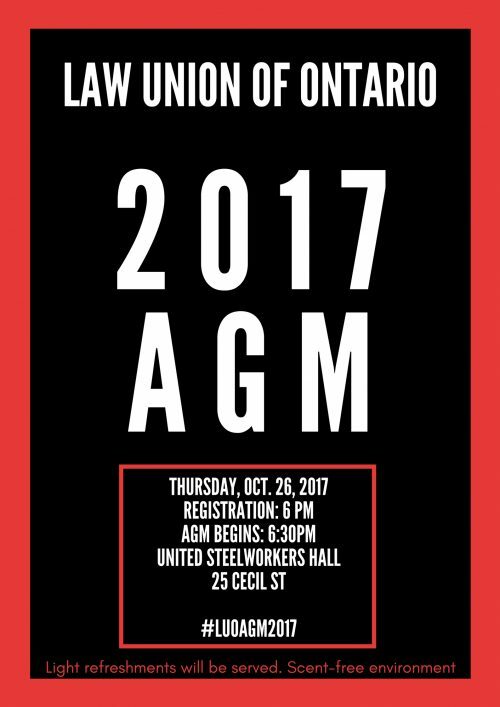 This panel is co-sponsored by the OPSEU Indigenous Mobilization Team.